and I wanted to bring the hostess a gift. I was so blessed, because last week a dear friend gave me this jar of homemade applesauce. Thanks Kim. I love the raffia ribbon and the buffalo check jar cover. Look at the nice chunks of apple in the applesauce. inserted near the center comes out clean. Time to wrap my delicious applesauce bread in a decorative way. This bread is so delicious and moist. It looks delicious and I love the way you wrap it.Hugs and happy new year wishes! I am a new follower and I know I am going to love your blog!! This is a precious idea! Thanks for joining us today in the blog hop!! 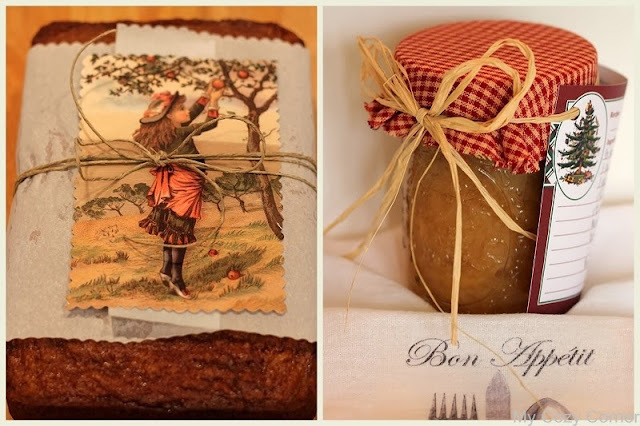 What a lovely hostess gift and it looks delicious. Your presentation is just beautiful! Thanks so much for bringing this awesome recipe to Full Plate Thursday today and have a great weekend! Your recipe is featured on Full Plate Thursday this week. Enjoy your new Red Plate and have a great weekend! My Christmas Gift to Me!